Ransomware-Locky is a ransomware that scramble the contents of a computer or server (associated network shares ,both mapped and unmapped and removable media) and demands payment to unlock it “usually by anonymous decentralized virtual currency BITCOINS”. 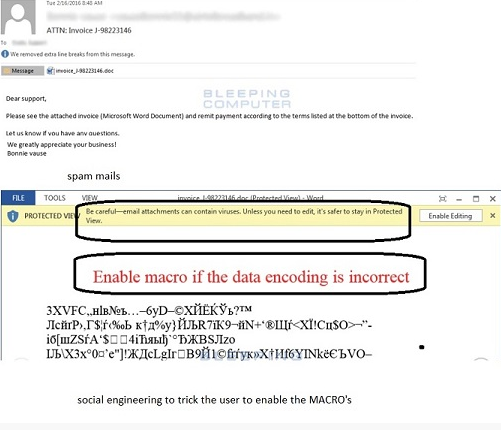 The contents of the original files are encrypted (renamed to .locky) using an RSA-2048 and AES-1024 algorithm.The compromised user has to pay the attacker to get the files decrypted. HKCU\Software\Locky\id – The unique ID assigned to the victim. HKCU\Software\Locky\pubkey – The RSA public key. HKCU\Software\Locky\paytext – The text that is stored in the ransom notes. Block connections to the IPS/ domains aforementioned. Blocking IP addresses should always be carefully considered and only when subject to the business needs. Create SRP rules to block execution of the executables listed in the IOC section. Disable Macro in Microsoft Office applications. Macros can run in Office applications only if Macro Settings are set to “Enable all macros” or if the user manually enables a macro. By default, it will be in a disabled state. The recommended setting is to select the option “Disable all macros with notification” in “Macro Settings”. Practice and Enforce Least privilege Policy. Lock down all open network shared to the lowest permissions. Follow safe practices when browsing the web. Ensure the web browsers are secured enough with best practices. Strict External Device (USB drive) usage policy. Keep your operating system, browsers, browser plugins & Antivirus Software up-to-date with the latest patches.